Background: Previous experimental and clinical studies have shown that lactate concentrations of 10 mM and more in solid malignant tumors may inactivate cytotoxic T cells as a major component of the immune defense of the tumor host. Additionally, it has been demonstrated recently that glucose depletion within cancerous tissue to concentrations of 1 mM and less may inhibit the T cellmediated immune response, as well. 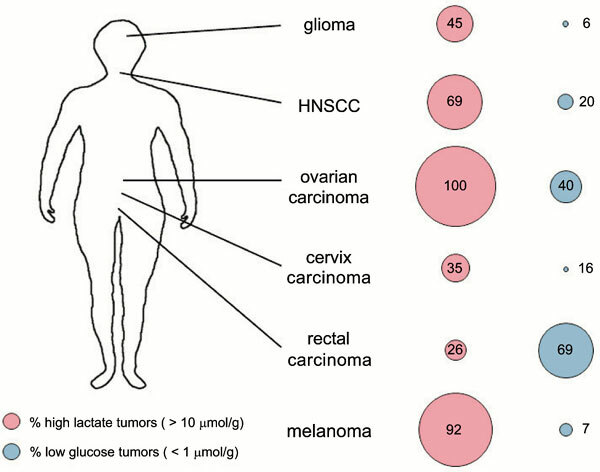 To evaluate the significance of lactate accumulation compared to glucose depletion in cancers, we have revisited previous data using the technique of induced metabolic Bioluminescence Imaging (imBI) in various entities of human tumor xenografts and tumors in the clinic. These tumor entities comprise squamous cell carcinomas of the cervix and of the head and neck, ovarian cancer metastases, rectal adenocarcinomas, glioblastomas, and melanomas. Tissue lactate levels in metastatic primary tumors were 1.5- to 2-times higher than those in non-metastatic primaries, and this was true for both patient cancers and corresponding tumor xenografts. Immunologically relevant lactate accumulation (≥ 10 mM) occurred in a large majority of all tumors investigated. In contrast, tumors with average glucose concentrations of 1 mM and less were rarely found in general with the striking exception of rectal adenocarcinomas, where 67 % of all tumors were low glucose malignancies. Conclusion: lactate accumulation in malignant tissue may be quantitatively more relevant for the immune escape compared to glucose depletion. However, in rectal adenocarcinomas both high lactate and low glucose concentrations may substantially contribute to the inhibition of the immune defense. Induced metabolic Bioluminescence Imaging (imBI), various human tumor entities, Warburg metabolism, lactate accumulation, glucose depletion, inhibition of cytotoxic T cells, Natural Killer (NK) cells.